I wanted to start this out by saying, Apple Crisp Bake with Crispy Muffin Crumble Topping. That’s all, nothing else, just think about how amazing your favorite Apple Crisp Bake is, now think about using an apple cinnamon muffin mix to create your recipe rather than flour and baking powder. 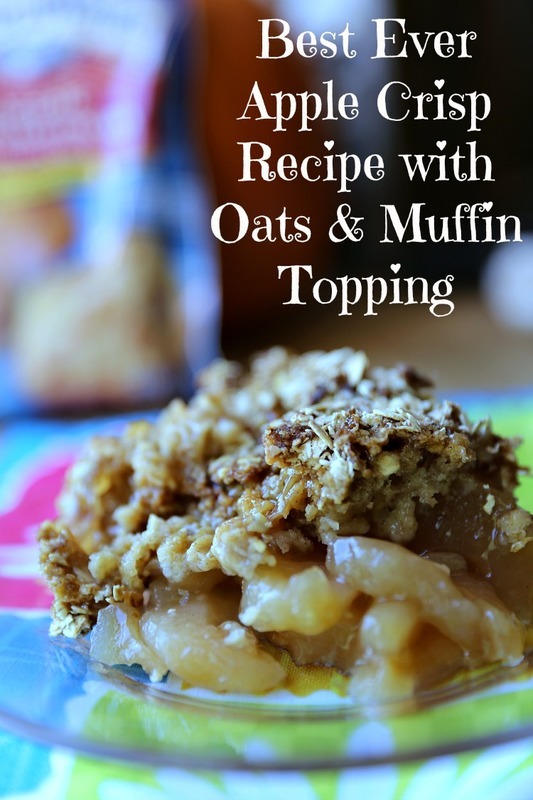 Tons more flavor, the center of the crumble is soft while the oats on the outside are crisp and sweetened with brown sugar. Sounds pretty good right? I thought it did and decided to give it a try and let’s just say WOW! I live in the southern corner of New Mexico. I can toss a rock and hit Texas, and we put green chili on everything, like this recipe for Green Chili Cornbread Muffins. Okay, so maybe we don’t put green chili on everything but I’m going to bet it’s most New Mexicans secret ingredient when friends and family come to visit. I’m always trying to spice up something in the kitchen, even my families traditional Apple Crisp Bake recipe. When I decided to play with the Apple Crisp Bake recipe and swap out a few things I never once thought it was going to taste better, different and good yes, but not better. 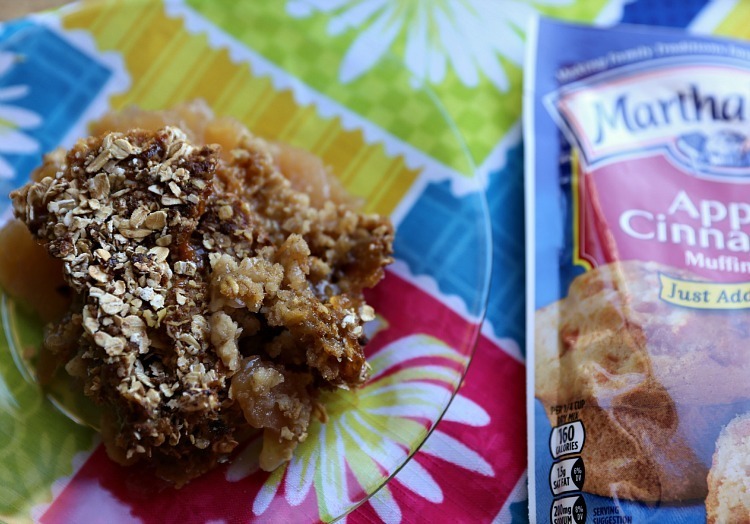 However, thanks to Martha White and her Apple Cinnamon Muffin Mix our Apple Crisp Bake recipe has turned into the Apple Crisp Bake with Crispy Muffin Crumble Topping recipe. Yup, the name grew quite a bit, which means the recipe got better, or we would have gone on about our day like nothing happened. All I did to the recipe was swap out the flour and baking powder for Martha Whites Apple Cinnamon Muffin Mix. This whole time, who would have thought it was as easy as grabbing one of Martha Whites muffin mixes that I buy in bulk because everyone loves them, they are quick, easy, and super convenient in the mornings. Martha White helps me make sure my kids have something in their tummy even on the most stressful of days. 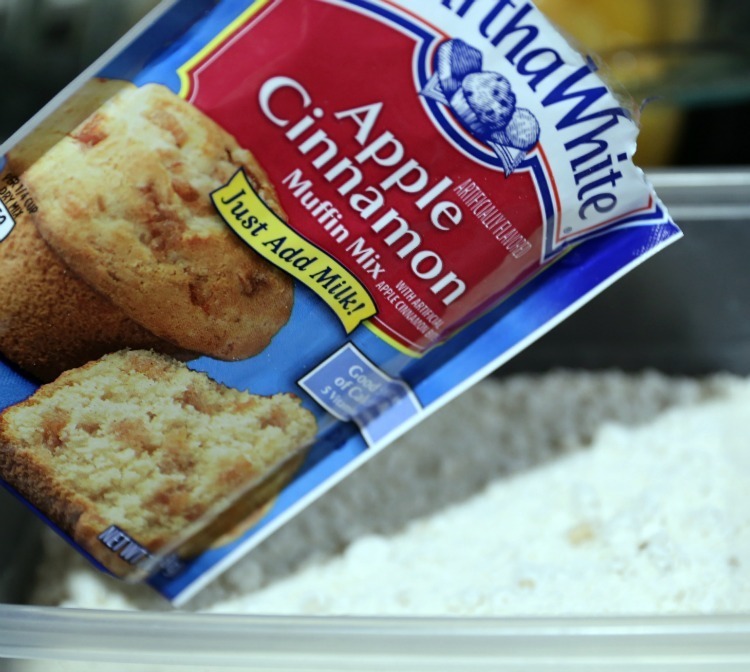 If Martha White baking mixes can do all that it shouldn’t be such a big surprise the apple cinnamon muffin mix improved our Apple Cinnamon Bake recipe as much. These things are awesomeness in a pouch. The Apple Crisp Bake and Crispy Muffin Topping was amazing but I’m not the only person who loved it. Get this, my brother called me a few nights ago and told me that Gavin (my soon to be nephew) wanted him to ask me if I could make him and his mom their very own pan of the new Apple Crisp recipe. Yea, I know he acted like this was going to work. Okay, it totally worked, there is no way I wouldn’t donate a little of my time to my newphew and sister-n-law (aka brother lol). Besides, doing these little things that put a smile on someones face makes me happy. 1.) Prepare pan. I like to use an 8 x 8 pan because the apple crisp bake is thick and loaded with flavor but pan size is your choice. If you prefer a thinner apple crisp bake use a larger pan. 2.) Preheat oven to 350 degrees. 3.) Pour canned apples into bottom of your prepared pan. Personally I put two cans in because I have a large family and everyone enjoys the thick layer of apples on the bottom. 4.) 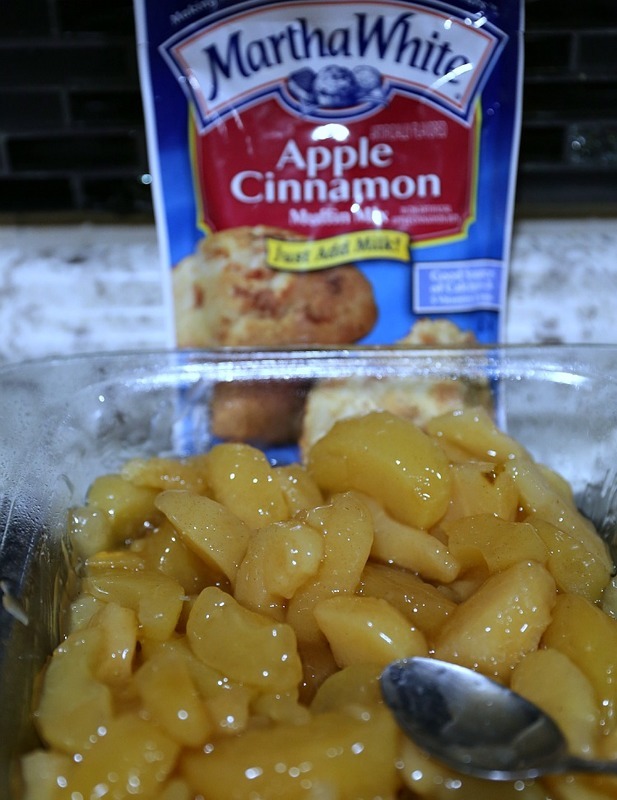 In a medium mixing bowl combine Martha White® Apple Cinnamon Muffin, brown sugar, oats and mix together. 5.) Cut in the butter using your hands, forks, or a pastry knife until the mixture is a nice crumble. FYI, I have done this recipe two different ways, they both are amazing. Rather than making the crumble you can soften butter, add it to the mixture and mix well. I actually add another small layer of oats and brown sugar because I accidently melted the butter one time and wanted crispy oats on top. However, you decided to do it the bake will turn out GREAT! 6.) Pour muffin mixture on top of apples and gently press down. 7.) In a baggie combine 1 cup of oats and 1/2 cup brown sugar and work together. You want to make sure the brown sugar coats the oats evenly. 8.) Pour the oat mixture on your soon to be apple crisp and gently push down. You want the oats to push into the muffin mixture some. 9.) Place in the oven for about 40 to 45 minutes or until top is crispy, golden brown and center is toothpick done. 10.) Remove from oven and allow to cool. TIP: I wanted to show you the above images so you know how thick this recipe is in an 8 x 8 baking pan. I have several friends and family members who prefer baking the Apple Crisp Bake in a 9 x 13 pan rather than the 8 x 8 pan I used for this recipe. It’s totally and completely up to you and your taste buds. 11.) Serve it warm with a little vanilla ice cream on top or eat it alone. 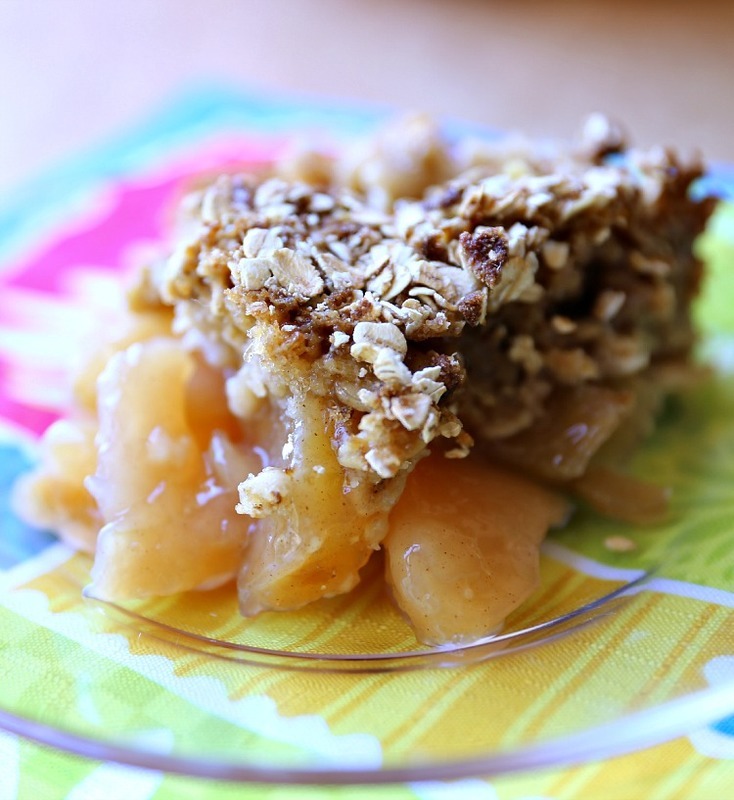 Apple crisp is great warm, room temp, or cool! It’s just some good old comfort food! If you missed my Easy New Mexico Green Chili Cornbread Muffins recipe than you might not know about Martha White® and the 49th Annual Country Music Awards. If you didn’t already know Martha White® is proud to be a sponsor of the 49th Annual Country Music Awards. The awards will air live from Bridgestone Arena this coming Wednesday (11/4/15) at 8/7 central. I always love the watching the Country Music Awards because of the performances, special moments, seeing entertainers be recognized and of course, being part of the celebration, even if it is from home! Whether you want to spice up one of your favorite dishes or you just want something quick, easy and convenient for those hectic mornings Martha White® is the way to go. You’ll find a variety of baking mixes, that taste great, mix and bake fabulously and you can grab them from Kroger. Not sure where the closest store is be sure and click here to find your local Kroger store. 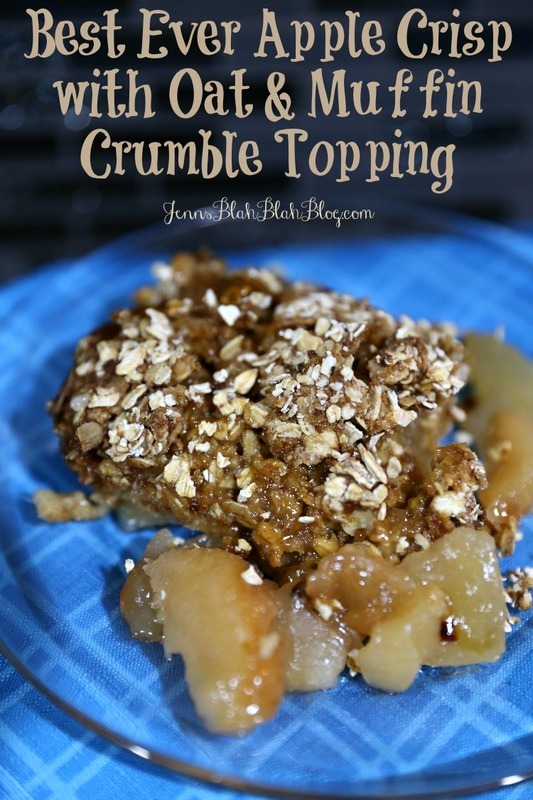 The Apple Crisp Bake has an amazing Crispy Muffin Crumble on top that is out of this world. I switched up the flour for muffin mix and the results are perfect. Prepare pan. I like to use an 8 x 8 pan because the apple crisp bake is thick and loaded with flavor but pan size is your choice. If you prefer a thinner apple crisp bake use a larger pan. Pour canned apples into bottom of your prepared pan. Personally I put two cans in because I have a large family and everyone enjoys the thick layer of apples on the bottom. 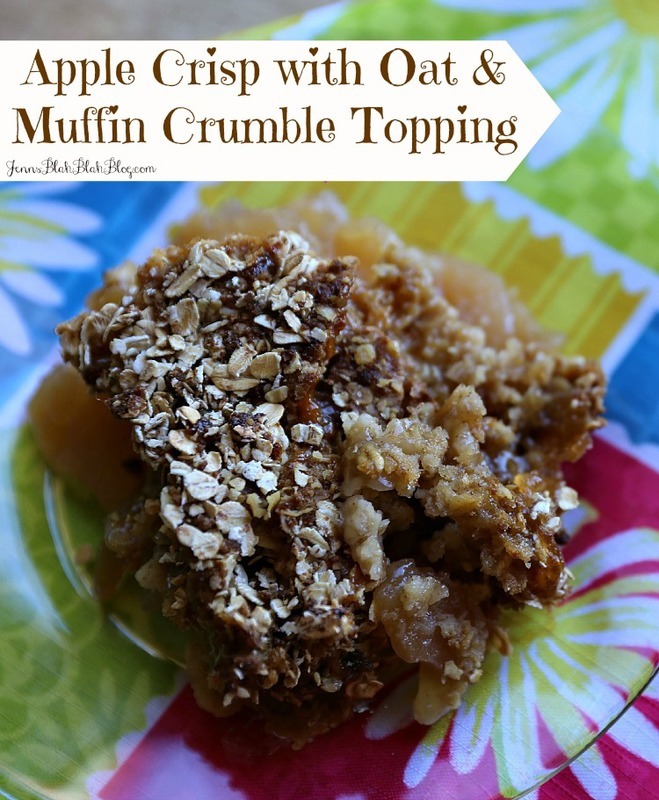 In a medium mixing bowl combine Martha White® Apple Cinnamon Muffin, brown sugar, oats and mix together. Pour muffin mixture on top of apples and gently press down. n a baggie combine 1 cup of oats and 1/2 cup brown sugar and work together. You want to make sure the brown sugar coats the oats evenly. Pour the oat mixture on your soon to be apple crisp and gently push down. You want the oats to push into the muffin mixture some. Place in the oven for about 40 to 45 minutes or until top is crispy, golden brown and center is toothpick done. Serve it warm with a little vanilla ice cream on top or eat it alone. 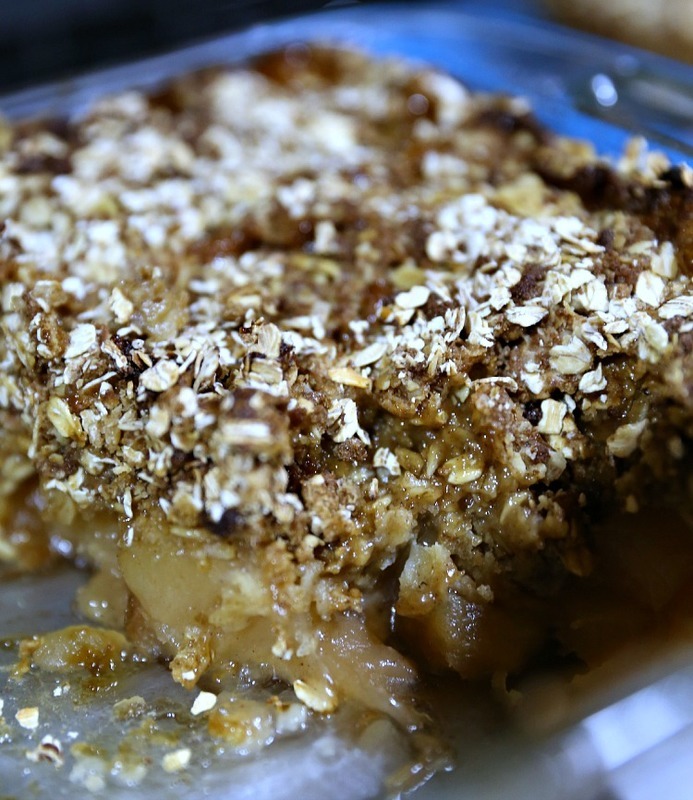 Apple crisp is great warm, room temp, or cool! It's just some good old comfort food! So what do you think about adding a Martha White® baking product to a certain southern dish you make? Is it something you’ll try, if so what is it and which mix will you use. If you’re not sure about the baking mixes just let us know about your favorite southern food. Tria Hair Removal Laser 4x, Getting Started! This looks yummy! I personally would try this recipe! Thanks for sharing! This looks so good! I will have to try this recipe soon! I love Apple Crisp! Thanks for the yummy recipe...I will think of you while I'm baking it!!! My step-mother used to bake it every year because she knew how much I loved it!!! That looks good. I have some apples, maybe I will make it. Wow, this looks easy enough to make, even for me! Personally, I don't care for anything with apples, but my mom and brother will love this. They eat apple pie, apple turnovers, you name it. Going to surprise them with this, maybe even for Thnaksgiving! This sounds so delicious and it is a simple to make recipe too, thank you for sharing!!!! It looks so delicious.Thank you for the recipe. That looks so delicious and I love that it is so easy! I would definitely top this with some vanilla bean ice cream! Yum! Perfect fall treat after apple picking! This is a delicious recipe. I love it with vanilla ice cream. Looks like a simple and delicious recipe. thanks for sharing! Oh yum! It's recipes like these that makes me wish I had never given up sugar. I'll have to see if I can tweak it to use stevia. Thanks! That sounds pretty good, and easy enough to make. I'll have to try this. Thanks! Yum! I love apple desserts/pastries, my favorite is apple pie. I cannot wait to give this a try. Thank you for sharing this recipe.